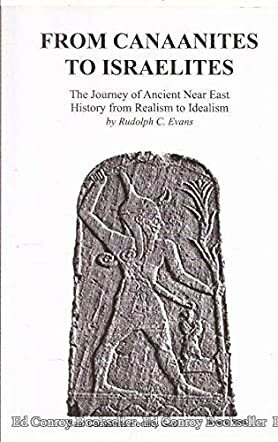 From Canaanites To Israelites: The Journey of Ancient Near East History from Realism to Idealism by Rudolph C Evans is a historical book on the origins and history of the Canaanites. From Canaanites To Israelites is a book that primarily describes the early Canaanites, how they came to be, and how they and their religious beliefs and practices evolved or changed over time, and how that in turn transformed over time into the belief system of the people of that part of the Middle East, what is now modern day Israel, Palestine, and Syria. From Canaanites To Israelites follows a more or less sequential narrative and delves into detail about many historical facts, wars and trade with the ancient Greeks, Egyptians, etc., the pagan belief system, the Jewish people who hold an importance place in this narrative, and much more. From Canaanites To Israelites: The Journey of Ancient Near East History from Realism to Idealism by Rudolph C Evans is a well-researched book into this particular subject that would be of interest to people who are interested in the history of that region, and specifically how history inevitably is connected with religion, whether for better or worse. I found many of the facts about this ancient civilization to be fascinating and many provided a fresh perspective. Although this is a historical book, it does revolve around religion and how that specifically evolves and changes over time. I found myself enjoying this book.